Have you ever wanted to start reading comics after watching the latest superhero movie but have no idea where to start? Never fear for the Z2 Podcast is here! Where 3 friends come together each and every week to breakdown the latest in comic book news, tv shows, movies, video games and give you our recommendations on what you should be reading! Not only that but we'll interview creators to talk about their work and give some perspective on the industry. So come join us as we drive each other mad and maybe you'll find your next favorite series! If anything, we hope that you'll at least get a laugh out of our ramblings. In this week's episode, we don't have a ton of news but we end up talking about random things for the first 15 minutes of the show. 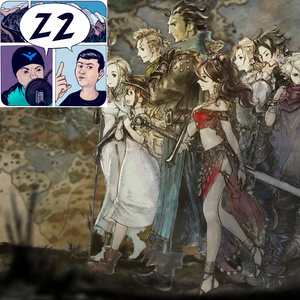 However, we later discuss the Disney and Fox merger that is going through as well as give our thoughts on Octopath Traveler 2 weeks in! As always, if you want to help out the show, there are a couple ways you can do that. You can start by leaving us a rating/review wherever you listen to the show, sharing this show to a friend, or by following us on Facebook and Twitter @Z2podcast. We also want to hear from you! Go to http://z2podcast.com/comment and send us your thoughts on the show!